Brentwood makes a profound difference locally and globally through a variety of programs, ministries and justice initiatives that are only possible because of your generous acts of giving. Indeed, it is only through your partnership that we are able to change the world together. Thank you. Thank you for supporting Brentwood! You can send a text to 417-283-8175 with the amount you would like to contribute. Make sure to include the dollar sign before the amount. Example: $25. Within a few minutes, you’ll be sent a text with a link to register. Click on the link and enter your cardholder name and credit or debit card information. Once your registration is complete, you will receive a text verification and a receipt via email. 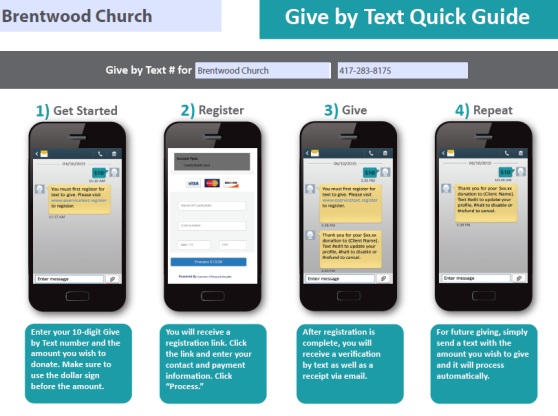 For future giving, simply send a text with the amount you wish to give, and it will process automatically. *Online and text giving is managed by Vanco Services, a Payment Card Industry (PCI) Level 1 Compliant Service Provider, which is the highest security ranking available.